The stunning triple H gold chain link bracelet from Hermes is a classic multi-strand bracelet in 18kt white gold. Featuring three 18kt white gold link chains that are connected by a classic, solid gold H motif equestrian element. 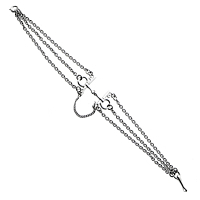 With a link clasp, the bracelet measures 6.3" in length.